JArgs 1.0 has the distinction of being the subject of the 13th post of my series on parsing command line arguments in Java. JArgs is an open source (BSD license) library that has been primarily supported by different contributors including Steve Purcell and Ewan Mellor. It turns out that this can lead to some confusion when first using JArgs because package names and other details change depending on which version of JArgs you apply. The JArgs project page describes JArgs as "a convenient, compact, pre-packaged and comprehensively documented suite of command line option parsers for the use of Java programmers." The page asserts that JArgs might be selected over other Java-based command line processing libraries because JArgs is "easy to use, thoroughly tested, well documented and liberally licensed (BSD licence so no GNU messiness)." The page also states, "The package is small and without frills, but is functional, and contains code that has been in production use for quite some time." JArgs is indeed small. The jargs-1.0.zip file is under 200 KB in size and the extracted core jargs.jar is only about 12 KB. There are no third-party library dependencies. The following screen snapshot demonstrates the contents of jargs.jar downloaded from SourceForge (the jargs-1.0.jar available on the Maven Repository is similar). The documentation for JArgs consists primarily of its Javadoc-generated API documentation and code examples such as OptionTest and CustomOptionTest. When using JArgs, the main class one uses is CmdLineParser (jargs.gnu.CmdLineParser or com.sanityinc.jargs.CmdLineParser depending on where you get your distribution of JArgs and which version you get). If using the JArgs JAR available via SourceForge download or via the Maven Repository, the primary class you'll be using is jargs.gnu.CmdLineParser. On the other hand, if you build JArgs from source available on GitHub (purcell/jargs), the main class will be com.sanityinc.jargs.CmdLineParser. In either case, there is just the one CmdLineParser outer class and it uses nested classes for additional support. In this post, I'm demonstrating examples based on the SourceForge/Maven JARs with jargs.gnu.CmdLineParser. The full source code of my examples will be posted on GitHub and that version will likely be edited to take advantage of more explicit imports for greater code conciseness and readability. JArgs is small and so surprisingly is simple. It doesn't provide a lot of fancy features, but it does do basic command line argument processing with a simple programmatic approach that doesn't make use of annotations or reflection. To implement the "definition" stage of command-line argument parsing with JArgs, one instantiates an instance of the CmdLineParser class and invokes the addOption(CmdLineParser.Option) method on that instance for each anticipated command line option. Each option is represented by an instance of a class that extends the CmdLineParser.Option class. In the examples in this series, I have been using a String-based file path/name option and a boolean-based verbosity option. 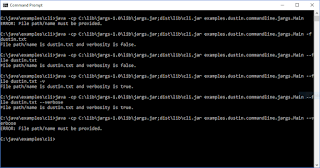 So, when using JArgs for these examples, I can use the class CmdLineParser.Option.StringOption for file path and name and the class CmdLineParser.Option.BooleanOption for the verbosity option. The next code listing demonstrates implementation of the "definition" stage with JArgs. "Parsing" with JArgs requires just one statement, but you do need to catch the two checked exceptions thrown by the CmdLineParser.parse(String) method or explicitly state that these are thrown from your code that invokes with method. This is shown in the next code listing. When the code just shown executes successfully (without throwing either of the two checked exceptions), the instance of CmdLineParser upon which the parse(String) method was invoked now contains the values parsed for the expected command-line options and so we're ready to "interrogate" that instance. JArgs "interrogation" stage of command line options processing uses methods on the CmdLineParser.Option-extending classes discussed earlier to retrieve the values parsed for each of those options. There are overloaded versions of the CmdLineParser.getOptionValue() methods for performing this interrogation. The method accepting only the instance of Option whose value is desired [getOptionValue(CmdLineParser.Option)] returns null if the option wasn't found or parsed. The method accepting the instance of Option whose value is desired and a second "default" object [getOptionValue(CmdLineParser.Option, Object)] returns the provided default object if that option was not found or parsed. In the code listing below, I use the second form in both cases and thus ensure I don't have to deal with null. With these basic code examples in place, running the simple Java application that uses JArgs to command-line processing is demonstrated in the following screen snapshot. The CmdLineParser class does not come with any built-in help/usage support. However, the jargs-1.0.zip available on SourceForge includes the source code for AutoHelpParser, a class which extends CmdLineParser and illustrates how help/usage could be implemented. Because it's dated and due to its simplicity, JArgs can probably be used with older versions of Java than some of the other Java-basd command-line parsing libraries discussed in this series. When I run javap on CmdLineParser in the Maven-provided jargs-1.0.jar and the SourceForge-provided jargs.jar, to determine the version of Java it was compiled with, I see that it's major version 45! As I wrote in my post "Programmatically Determining Java Class's JDK Compilation Version", a major version of 45 indicates that the code was compiled with JDK 1.1! Here are characteristics of JArgs to consider when selecting a framework or library to help with command-line parsing in Java. JArgs is open source and is licensed with the BSD license. There seems to be some confusion about versions and primary contributors to JArgs with Maven and SourceForge having one version and purcell/jargs on GitHub having another version. JArgs is small and simple: the jargs.jar (or jargs-1.0.jar on Maven) is only about 12 KB in size and there are sno third-party library dependencies. JArgs uses programmatic APIs for defining, parsing, and interrogating options rather than using annotations or reflection. JArgs is a bit dated with many of its main pages having "latest updates" with years such as 2005. However, the GitHub page referenced in this post several times, and which has the different package name for its main class, shows its last updates being 2012. I believe that JArgs could be used with the vast majority of Java applications today as it appears to me to be able to work with Java versions as far back as Java SE 1.1. The most compelling reasons one might have to use JArgs instead of some of the other more commonly used and/or more recently updated Java-based command-line processing are its simplicity and small size. I sometimes face the decision of what level of command-line options I want to support JArgs provides a library that might be desirable when I want just a bit more than directly parsing the passed-in String to the main function, but don't want the power and complexity of some of the other Java-based command line processing libraries. My biggest concerns about using JArgs are probably that it hasn't been updated in a while and the potential confusion that could result for others using my work and having to deal with two different manifestations of JArgs with difference package name for its main class (using Maven for the dependency could help a lot here). JArgs is small and simple and might find its niche for those only desiring the most basic command line processing. Ewan Mellor's Page: "JArgs: A command line option parsing suite for Java"
The featured library for my twelfth post on processing command-line arguments in Java is Command-Line Arguments with Java Reflection (CLAJR). This "library" is a single Java source file (CLAJR-0.9.java) available for download on SourceForge. The main page for CLAJR currently shows a 2006 copyright date and the downloadable source zip file CLAJR-0.9-src.zip is dated 6 December 2008. Although CLAJR appears to be largely unsupported in recent years and although it's unlikely that I'd choose CLAJR over some of the alternative libraries already discussed in this series for processing command line arguments from Java code, I believe CLAJR warrants a post focused on it. There are some fairly unique characteristics of CLAJR that make it interesting, even if one chooses not to use it. CLAJR is not provided as a JAR. Instead, it's provided as a single zipped file with a single Java source code file contained in that ZIP file. 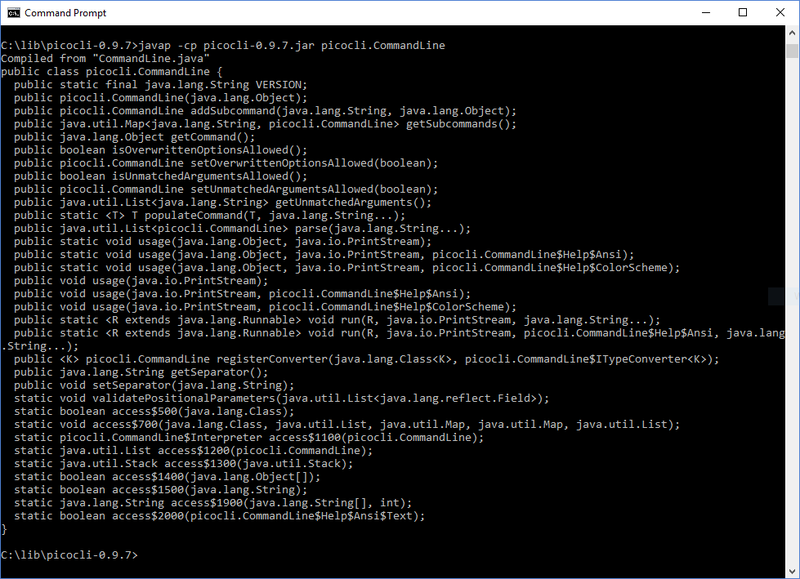 Being available as a single source code file is not unique to CLAJR; Picocli also is provided in a single Java source code file. 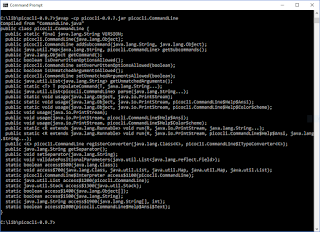 However, Picocli also makes a JAR available on the Maven repository (which I used when working with Picocli), but I'm not aware of a pre-built JAR with the appropriate .class files for CLAJR. Therefore, because I prefer a JAR over a source code file when using third-party libraries, the first thing I did when experimenting with CLAJR was to build its provided source code into a small JAR file. Unzip CLAJR-0.9-src.zip to extract CLAJR-0.9.java. Create a directory clajr to represent the Java clajr package that the Java source class should exist within. 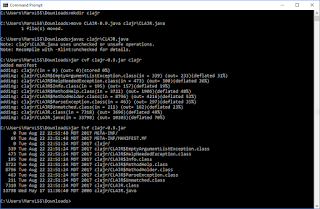 Move the CLAJR-0.9.java file to the clajr directory and rename it CLAJR.java to match the name of the class inside that source file. I also had to edit the source code to make a minor change; this is discussed in more detail later in the post. Use javac to compile the CLAJR.java file into the multiple class files. Use jar to assembled the compiled .class files into a JAR (I named it CLAJR-0.9.jar). The above steps are illustrated in the following two screen snapshots. The Java-based command-line parsing libraries covered so far in this series tend to use annotations or specific programmatic APIs to allow for the definition, parsing, and interrogation of command-line arguments in Java code. CLAJR, as its full name suggests, instead uses Java reflection for defining the expected arguments to be parsed. The main CLAJR page describes why the author chose reflection on methods' names for defining command-line arguments. CLAJR looks for methods that are named to correspond with the parameter or parameters being processed. A single underscore precedes a method name for a single-hyphen command-line argument while a double underscore precedes a method name for a double-hyphen command-line argument. A single method can be named to align with multiple command-line arguments when the multiple command-line arguments do the same thing. 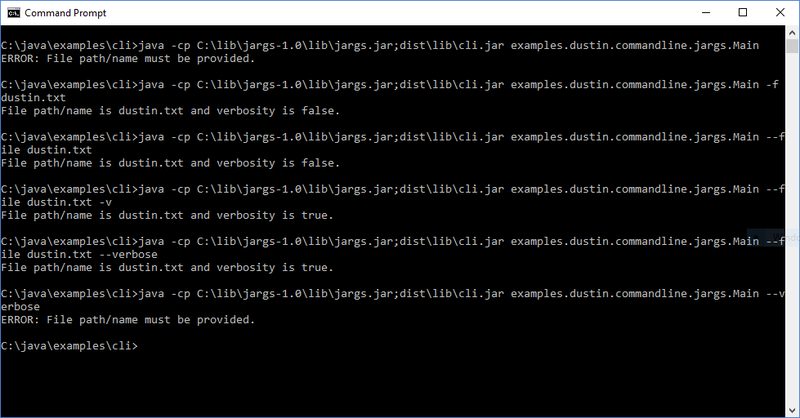 As with the other posts in this series, my example for this post demonstrates use of the CLAJR library to model --file/-f command-line arguments and --verbose/-v command-line arguments. To "define" these in CLAJR, I need to name my methods _f__file and _v__verbose to correspond to -f/--file and -v/--verbose arguments. This is demonstrated in the partial snippet of a nested class Options in the next code listing. * options defined as fields in this class. Parsing with CLAJR is a matter of a single statement. The next two lines of code demonstrate calling the static CLAJR.parse(String, Object...) and passing to it the command-line arguments and just-instantiated instance of the Options class partially shown above. In the single line parsing shown above, there is no return value from the parse method. Instead, the passed-in "options" instance has its fields populated according to which arguments are provided on the command line. CLAJR uses reflection on the "options" instance's methods to find the methods to invoke when corresponding arguments are discovered on the command line. It is this instance of Options that one can "interrogate" to find the values of arguments on the command line. This is demonstrated in the next code listing. out.println("File is '" + options.getFile() + "' and verbosity is set to '"
CLAJR supports providing of help/usage information on a per-method basis through reflection. In this case, methods are named with a convention similar to those for the command-line arguments themselves, but with help in front of the method name. This is demonstrated for the two combinations of arguments shown earlier in the next code listing. The methods in the code listing just shown provide "help" strings for the -v/--verbose and -f/--file arguments. The static CLAJR method CLAJR.getHelp() method provides a String representing command-line usage that is based on these methods. CLAJR provides different exceptions that can be captured and these are often useful in conjunction with the "help" methods. These are demonstrated in the next code listing which shows the multiple catches that can be performed related to different error cases and other situations that warrant display of error information. CLAJR 0.9's CLAJR.parse(String, Object...) method throws a Throwable and so the code above catches that Throwable. The three screen snapshots that follow demonstrate this simple example. The first image shows the usage printed when no argument is provided. The second image depicts a normal flow of defining, parsing, and interrogating command-line arguments. The third image demonstrates display of help information when an unexpected argument is provided on the command line. To get my examples to work, I had to change the CLAJR.java source file. Specifically, I changed line 491 in the invoke(String, String, boolean, List) method from if (tails == null) to if (tails == null || tails.isEmpty()). This is one of the advantages of open source; one can adjust or fix the code as necessary. CLAJR allows a method named with a single underscore to be reflectively accessed. This - method corresponds to the "tail" parameter or parameters. I didn't use this in this example, but it's interesting to note that this will not work in JDK 9 because a single underscore is not allowed as an identifier in JDK 9. In fact, JDK 8's javac warns about this now as shown in the next screen snapshot. Here are some additional characteristics of CLAJR to consider when selecting a framework or library to help with command-line parsing in Java. CLAJR is open source and licensed with the GNU Lesser General Public License (version 2.1 or later). CLAJR is available for download as an approximately 11 KB zip file called CLAJR-0.9-src.zip that contains the single file CLAJR-0.9.java. CLAJR 0.9 does not require any third-party libraries to be downloaded. CLAJR has been around for a while, but appears to not have been updated for several years. I had to make a minor change to the source code to get it to work properly for me. 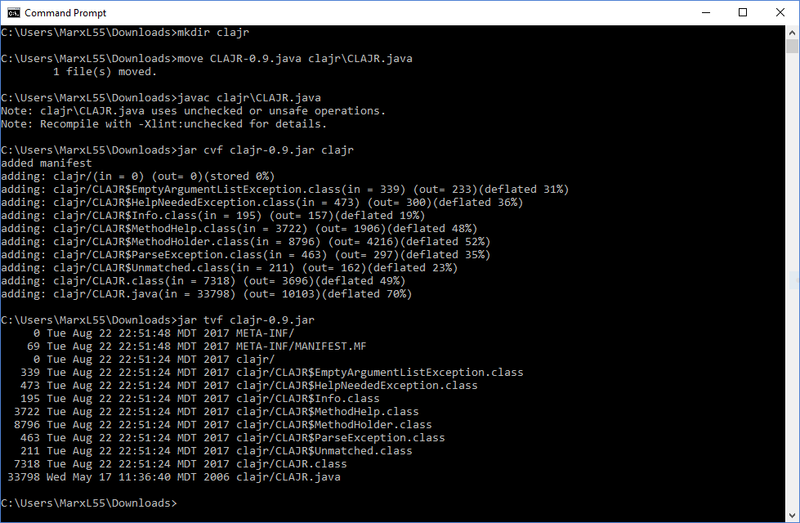 CLAJR is a Java-based command-line processing library that is primarily distinguished from other libraries covered in this series by its use of reflection. Reflection is used to define expected command line arguments as well as the help messages associated with those arguments. CLAJR offers some unique ideas and approaches related to command-line processing in Java, but it's a somewhat dated library. Full source code for this post's examples is hosted on GitHub. The Ostermiller Utilities command line parser does not use annotations, but instead employs the programmatic builder with fluent API concept that some of the other Java-based command-line parsing libraries have also used instead of annotations. The classes com.Ostermiller.util.CmdLn and com.Ostermiller.util.CmdLnOption are used together in the "definition" stage of command-line processing with CmdLn. This is demonstrated in the next code listing. The CmdLn class also has getResults methods that return a List<CmdLnResult> to access multiple parsed options. The examples above demonstrate checking the results of the getResult() method call for null to determine whether an option is set or not. The full source code of the Java application used for this post is available on GitHub and uses CmdLn.present(char) instead of null checks for determining presence of an option. The differences can be seen here. The next three screen snapshots demonstrate use of this simple Java application using Ostermiller Java Utilities command line parser. The first image depicts the output when no arguments (including the required file path/name argument) are specified. The second image depicts the help/usage output generated when the --help or -h option is specified and shows that there is no error message about the missing parameter in this case. The third screen snapshot demonstrates "happy path" execution of the simple application using the short and long forms of the file and verbosity options. Picocli's use of annotations on instance-level fields is similar to some of the other Java-based command-line processing libraries and enjoys the same advantages.